Albert, a master florist, was born in 1884 but didn’t arrive in Datchet until after the 1911 census. By 1915, he had set up a greengrocer’s and florist’s shop, Martell & Mason, on The Green. (His business partner was probably Charles Henry Martell, who in the 1924 edition of Kelly’s Directory, was listed as a nurseryman at The Myrke.) Albert also had a listing in Marshall’s Directory 1916, see image, left. Albert quickly made his mark in the village. The Windsor Express described him as an energetic member of the Working Men’s Club (now the library) and he assisted the various institutions supporting the war effort. May was a lady’s maid at Inniscrone, on the corner of Queen’s Road and Buccleuch Road. Inniscrone was owned by one of the de Paravicini brothers, Henry Farquhar, so May would have been working for his wife, Lady Eva, née Cholmondeley. Lady Eva’s sister, Marcia, had married Henry Farquhar’s brother, Percy John de Paravicini and they were living nearby at Riverside. Both families contributed greatly to the war effort in the village, taking the lead in many local and wartime organisations, whether running them, fundraising or contributing practical help. On 25 April 1916, having been married for just one day, Albert joined the West Surreys, the 3/4th Queen’s (The Queen’s Royal West Surrey Regiment) as Private 4727. After his training, in mid-September 1916 he was sent to France as Private 6190 of the 1/22nd (The Queen’s) Battalion, The London Regiment. The 1/22nd was in the 142nd Brigade of the 47th (2nd London) Division. The Division had been engaged in the Battles of the Somme at Flers-Courcelette and the Transloy Ridges. At the beginning of October, plans were being made to attack the Butte de Warlencourt, a strategically-important 60-foot ‘mound’ fortified with machine gun posts and barbed wire. In preparation for the attack, the 47th Division planned to capture the nearby farmstead of Eaucourt L’Abbaye. Albert, the 32-year-old master florist, went into the trenches on the first day of the attack, 1 October 1916, and was killed the following day. On 3 October the Division had secured the farm. Left: The following month, Datchet Parish Magazine also reported Albert’s death. Albert Henry Mason has no known grave. He is remembered at Thiepval Memorial, Somme, France. The Commonwealth War Graves Commission website explains: “The Thiepval Memorial, the Memorial to the Missing of the Somme, bears the names of more than 72,000 officers and men of the United Kingdom and South African forces who died in the Somme sector before 20 March 1918 and have no known grave. Over 90 per cent of those commemorated died between July and November 1916. Albert was awarded the British War Medal and Victory Medal. May Mason’s last known address was 54 First Avenue, Hove, the house of Lady Eva de Paravicini. 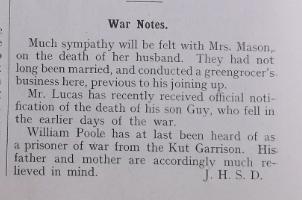 A 65-year-old May Mason died in Hove in 1947.